Olivia Holland is a graduate of the Royal Ballet School White Lodge and Elmhurst School for Dance whose professional dancing career has included contracts with Royal Ballet of Flanders (November 2011 – June 2012) and Northern Ballet (July 2012 – July 2015). Ever since she started touring with Birmingham Royal Ballet while she was a student at Elmhurst, Olivia has been painting pictures inspired by her life as a dancer. These exquisite artworks are influenced by the performers she has worked with, the ballets she has danced in and the countries and theatres she has visited. A keen photographer, she has also recorded her experiences backstage in captivating snapshots. 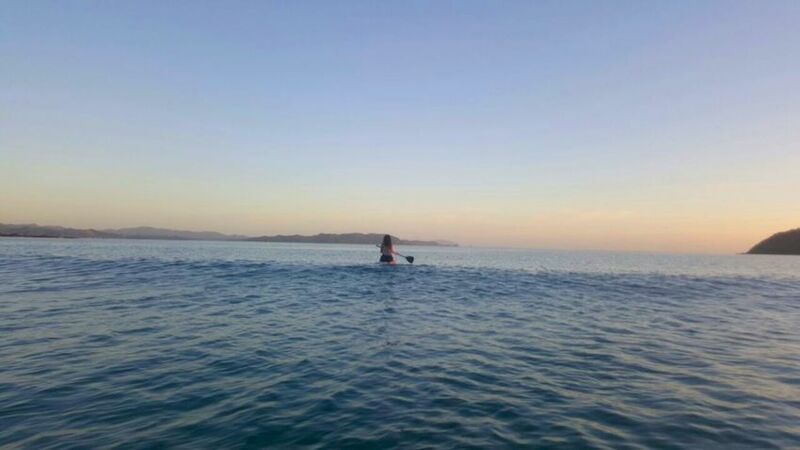 Since Olivia last graced this site for an interview in June 2014, her entrepreneurial spirit and sense of adventure has taken her to the island nation of New Zealand, also known as the ‘Paradise of the Pacific’. Surrounded by stunning natural beauty, motivated to continue painting and newly devoted to the art of teaching, Olivia is falling in love with dancing – and the life it has given her – all over again. It is wonderful to have this opportunity to catch up with you Olivia, as so much has happened since our last interview! You had the chance to enjoy a brand new start when you left Northern Ballet last year and have created an incredibly full life for yourself in New Zealand. How did that happen and what made New Zealand your chosen destination? New Zealand is amazing. I’ve been here a year already and I’m still taken away by the views, beaches, sunsets and just endless exploring. I really needed this and to get away to have a change. 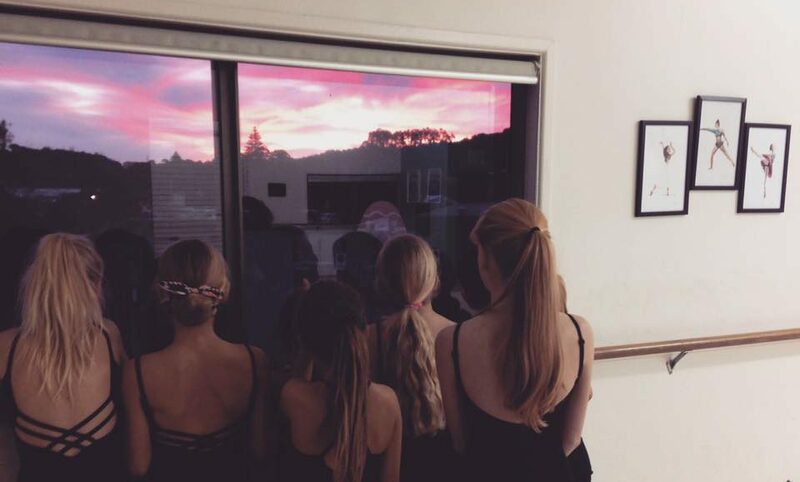 Most people will agree ballet is a really intense lifestyle.I reached a point where I wasn’t happy anymore and the enjoyment started to fade away. It was hard to know why since I finally reached the goal of becoming a professional ballet dancer after years of training, but I really needed to be inspired again. It wasn’t easy making this decision, but, after a lot of thinking… New Zealand became my destination! Had you ever been to New Zealand before? Is it somewhere you had visited as a dancer? I had never been to New Zealand or this side of the world! I travelled a lot as a dancer and became really used to settling into new places, so it didn’t seem any different to take another adventure by myself. My cousin lives in Auckland which is the main reason I chose to come here because at least I would know one person and have a touch of family. Apart from that, I’m such an outdoor person. The views, sea, mountains, sunsets – it is all like a remedy and I felt this is what I needed to clear my head and start fresh again. I don’t think I could have imagined myself ending up living on a better place than Waiheke Island, surrounded by beauty every day! It is certainly a brave move to leave the familiar behind and embark on an exciting adventure on your own! Was it always the plan to start teaching in dance studios when you arrived in New Zealand? Has teaching always been something you hoped to pursue? I actually didn’t want anything to do with dance once I decided to leave my ballet company and I was quite stubborn with that at first. It all got too much and I really needed to break away. But I had always had such a passion for dance and I’m so glad I didn’t let it go. I booked my flights to New Zealand before I had any idea what I would do for work. I naturally started panicking slightly before and decided to email all the dance schools I could find in Auckland! There was one ballet school on Waiheke Island – Louise Emma Academy of Dance (LEAOD) – whose owner, Louise Callin, also trained at Elmhurst School for Dance in Birmingham, UK. It was a crazy moment when we got in touch, I almost thought it was too good to be true. We connected straight away and it was the start of an amazing journey. Still, now, I am so grateful for how everything fell into place. So I live on Waiheke Island teaching at Louise Emma Academy of Dance (LEAOD). I also spend time in Auckland teaching at some great schools – Victoria Phillips Academy, SABA Ballet and Auckland Academy of Dance. It sounds as if you are keeping very busy and working hard at something you enjoy. How lovely to now be in such a privileged position, with the possibility to inspire so many young dancers! What ages groups are you teaching? And are you mostly teaching ballet or other dance styles as well? I teach all age groups from baby ballet to adults! Ballet is my main subject, but I also do technique, stretch and body conditioning. I’ve been able to cover for contemporary, modern and jazz classes because my training was very extensive as a dancer. There are lots of competitions in dance over here so it’s great to get involved with that, as well as choreographing for the shows at my different dance schools. 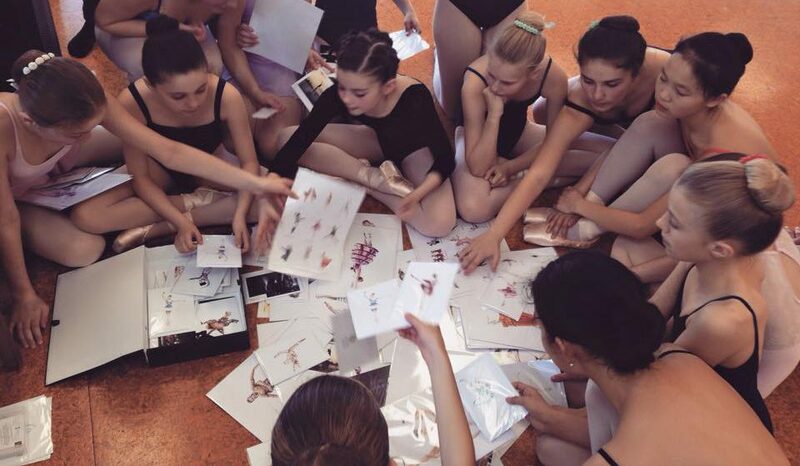 I’m constantly learning as a teacher and it is my main motive to inspire other dancers. With so many students to motivate – and your artwork to invest time in – are you still able to fit in any opportunities to dance yourself? Will you still go to classes or seize performance opportunities? I’m not taking class anymore unless I join in with any of the ones I’m teaching. I’m actually getting more affected by a foot injury now then when I was dancing, but I have performed in the school show for LEAOD. Performing is not something I want anymore, but I’m happy that the love I had for dance is gradually coming back and I can give back through teaching. That’s not to say I don’t have the occasional dance in the studio though! I am so happy to know that you are still managing to create your amazing artwork, even while forging ahead with a teaching career in a new country. Has it proven to be really challenging, especially in terms of the printing processes and taking orders? Has a new environment provided new inspiration? It looks like your students cannot get enough of your creations? I didn’t bring much luggage over with me to New Zealand, but I did bring a huge selection of my artwork! I actually thought I’d have to stop it all for a while, but when I first came over here I gave some dance workshops to various schools and brought my artwork with me. 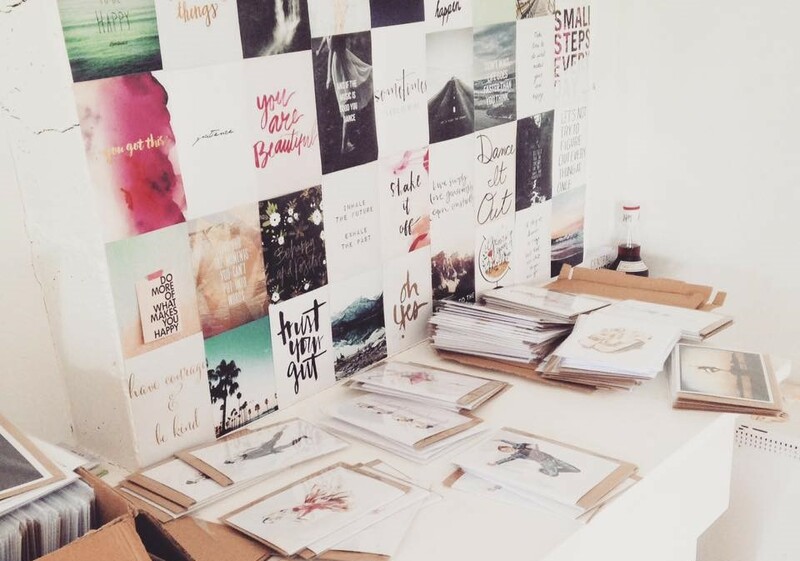 They all seemed to love it and soon I found a printing shop in Auckland City, then eventually one on Waiheke Island – Island Print. It’s great to share my artwork with even more people over here. I’ve created some commissions for my students, as well as still sending orders back to the UK, so I’m just happy to be able to keep it going. I honestly came over to New Zealand with no expectations other than to take some pressure off myself and find some freedom so I’m really grateful things naturally started to come together and it is definitely providing me with new inspiration! At times I think it is crazy how I did just leave everything and launch into a complete new start but things have their way of working out. Sometimes you really have to follow that feeling and go for it. Thank you so much for sharing your thoughts and opening up about life after working as a professional dancer Olivia. Good luck in all of your further adventures! > Visit Olivia’s online shop to view her beautiful artwork and follow her New Zealand adventure on Instagram.